The highest (and second largest) resort in British Columbia is known to local's as the 'Friendly Giant'. 55km from the regional airport in the town of Kelowna, this is the largest resort in the interior of British Columbia, with full-service facilities on site. When will it snow in Big White? The next notable snow forecast for Big White is 4cm1in, expected on 26 April, with around 18cm7in forecast over the next 7 days. How High is Big White? The Canadian Ski Resort of Big White has direct access to 112 marked pistes, served by a total of 13 ski lifts. The ski resort itself is at 1,760m5,774ft, so skiing or boarding back to the resort is usually possible. 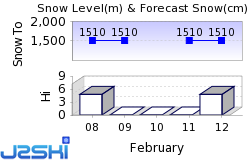 With ski lifts as high as 2,290m7,513ft, snow cover is generally reliable. The highest (and second largest) resort in British Columbia, Big White is known to locals as the 'Friendly Giant'. Somewhat overshadowed in size and international reputation by its famous neighbour Whistler, Big White has been quietly growing in size and fame so that it now attracts discerning skiers and 'boarders worldwide. Its twin track approach of offering the highest quality facilities and at the same time a terrain mix that has reached cult status is reminiscent of Crested Butte next to Aspen in Colorado. Rapidly expanding, Big White keeps adding new lodging to its extensive accommodation base, all slopeside and to its quota of high speed lifts. A major natural asset is the abundant powder snowfall which averages more than 7.5 metres (24 feet) annually - this snow is said to fall regularly throughout the season,, rather than being confined to huge one-off dumps, so the two thirds of patrolled terrain that is left ungroomed has fresh powder more frequently than most. This factor underlies Big Whites reputation with advanced skiers and 'boarders despite the fact that only just over a quarter of the terrain is graded advanced. The big snowfalls are also responsible for the creation of 'snow ghosts' a common feature in Japanese resorts but less well known elsewhere in the world. Heavy snowfalls literally cover up threes and the action of wind and freezing temperatures can transform them in to weird shapes creating a magical and surreal environment in which to ski or 'board. The most difficult run is the 'Prudance Bowl'. With more than a hundred named trails, Big White lives up to the 'big' bit of its name. These cover roughly a third of the patrolled terrain, but much of the 'off piste' is also skiable. The resort doers have a reputation for cloudy weather (the 'White' part of its name, not just the snow) but the presence of a large number of gladed runs means you can often ski below the clouds when this is the case. Crowds are rare, especially mid-week. At weekends the resort is popular with locals from Kelowna but the steeper sections are rarely busy. Intermediates have almost two thirds of the mountain graded at their standard including long fast cruisers of up to 7.2km (four and a half miles) long and fun bumps and gladed runs. The toughest terrain is in the double-black diamond Back Bowl which features dramatic cliffs hiding chutes with pitches of more than 45 degrees in some cases. Free tours of the mountain are offered by Snow Hosts. Night skiing and boarding is offered from 5pm to 8pm from Tuesday to Saturday, from Mid December to end of March with access through the Plaza chair, the Bullet Chair and Telus Terrain Park. Big White's lift pass is good at neighbouring Silver Star Mountain Resort, under the same ownership and located 130km (81 miles) away at Vernon. The Big White ski school offers lessons for all ability levels including a wide variety of group and private lessons right up to ski instructor training. Bumps clinics and special tuition to help you make the most of carving skis are also on the itinerary, and cross country tuition is also available. Night skiing in the resort is also available, the most extensive in Western Canada. Big White offers good sking, particularly, for Expert and Intermediate skiers. The snow park offers over 1,000 acres of natural free riding terrain and is groomed regularly. The park features a super pipe. Beginners have a quad chair served beginner area and a dedicated 'boarding school. A wide range of rentals are available. Adult Snowboard Camps are organised regularly throughout the season. These include two full days of learning or refining your riding technique. The package includes 8 hours of lessons, video analysis, and an après-ski event on the last day. When is Big White open? We don't currently have confirmed season dates for Big White. Usual opening is early December, and usual closing is Early April. NOTE:- Lift and Piste openings are always subject to Snow Conditions in Big White. Big White is able to make snow, on 1km1 miles of ski runs, with 2 snow cannons. The 13 ski lifts of Big White are able to uplift 234,000 skiers and snowboarders every hour. Big White is in Kootenay Boundary E, Kootenay Boundary, Canada. The nearest airports to Big White are Kelowna and Penticton, all within three hours drive. Kelowna is just one hours drive away, in good driving conditions, so you can be on the piste quickly. Big White boasts Snowshoe Sams, which has been voted the best après ski bar in Canada. Friendly and casual it includes pool tables, dance floor and restaurant/lounge. The Raakel's in Das Hofbrauhaus (open to 1am every night except Sunday) and Happy Valley are two other popular bars. Apart from eating, drinking and dancing, ice skating is available until 1.30pm most days on the open-air rink in the centre of the resort village and moonlit snowmobile tours are another possibility on certain nights. Want to ask about skiing and snowboarding in Big White? Or contact Big White Tourist Office. Note :- The information on J2Ski concerning Big White, where not clearly factual, is opinion only and is neither definitive or exhaustive.